This is the time to internet and education are spontaneous on the online based website. Here are some of the most useful websites on the internet that you should really know about. These websites are cool and have a simple web address for memories and trip to Google. There are some 175 million websites on the internet and it will be increased daily basis. In this list maximum are most useful websites. Some of them are extremely popular as, like Google, Wikipedia, Facebook, Youtube and you probably use them every day. All of these sites are also extensive sources of knowledge. 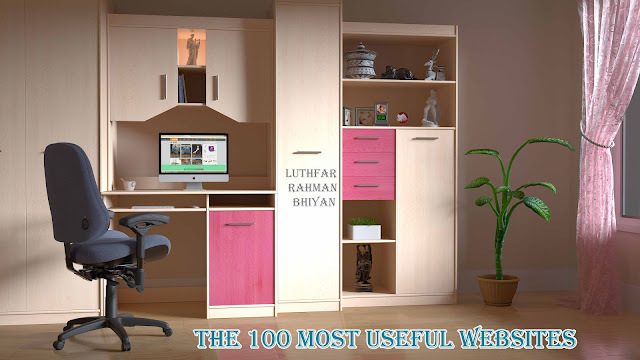 In this post I will share will you most useful websites list with 100 extreme URL. These incredibly useful websites enhance your productivity from now! 1. zerodollarmovies.com - Find Full-Lenth Movies On Youtube. Here are 15,000 movies in multiple languages that are free for the watch on youtube. 2. dictation.io - Online voice recognition which after covers up you can take output with notepad in your computer from the web browser. 3. goo.gl - Shorten long URL for professionals looking. 4. unfurlr.com - Find the original URL which shortens before for use. 5. qClock - Find the local time of a city using Google map. 6. copypastecharacter.com - Copy special character that not visible in your keyboard. 7. codeacademy.com - This is the best place for online coding learning. 8. lovelycharts.com - create flowcharts, sitemaps & network diagrams. 9. iconfinder.com - You can find here all sizes icon for use. 10. office.com - Download all kind of template, clip art, and stock image for using your Office Documents. This is a part of Microsoft. 11. followupthen.com - Free & Easy Email Reminder. 12. jotti.org - Scan any file or email for removing the virus. 13. wolframalpha.com - Get answer by just enter what you want to calculate or know about. 14. printwhatyoulike.com - Print web page What YouL like to your browser. 15. ctrlq.save - This site give you a chance for saving your file to google drive or dropbox directly. 16. ctrql.rss - A search engine for RSS feeds. 17. e.ggtimer.com - Simple Online Timer. 18. coralcdn.org - If your site is down due to having traffic, try accessing it. 19. random.org - Pick random numbers. 20. pdfescape.com - Online PDF editor and form filler. Always free! A smart alternative to Adobe® Acrobat for Windows. 21. tubemogul.com - Upload the video to youtube or others video sites. 22. scr.im - Share your email address online without any spamming. 23. myfonts.com/WhatTheFont - Quickly determine the font name using any image which is visible with the font. 24. google.com/webfonts - A good collection of the free font. 25. regex.info - Jeffrey's Image Metadata Viewer. 26. livestream.com - broadcast events with your desktop screen live over the web. 27. iwantmyname.com - Helps you search domain name by TLDs. 28. homestyler.com - Decorate your home with 3d. 29. join.me - Share your screen with anyone over in web. 30. onlineocr.net - Convert scan PDF to Word. 31. flightstats.com - Track flight status at the airport all over the world. 32. wetransfer.com - For sharing any larger files online. 33. hundredzeros.com - This site is available for download free Kindle books. 34. polishmywriting.com - Check your writing for spelling and grammatical errors. 35. marker.to - Easily highlight the web page for sharing. 36. typewith.me - Here are able to word on the same document with multiple people. 37. bloggigadvise.com - In this post you can select the best free blogging platform for start blogging. 38. lrbtravelteam.com - You can get here about Bangladesh travel tourism and it's people and inside documents. 39. whichdateworks.com - Find a date that works for all, it will for event planning. 40. everytimezone.com - View of the world time zone. 41. gtmetrix.com - Measuring your website performance online. 42. noteflight.com - Pring and write your own music online. 43. imo.im - Chat with your buddies on Facebook, Skype, Google talk or others from one place. 44. translate.google.com - Translate Google sheet, Web Page, and Office Document. 45. kleki.com - Create painting and sketches. 46. similarsites.com - Finding new sites that are similar what you want already. 47. wordle.net - Wordle is a toy for generating “word clouds” from the text that you provide. 48. bubbl.us - Create Mind-Maps. 49. kuler.adobe.com - Get Color Idea for any kind of design. 50. liveshare.com - Share your photos instantly. 51. lmgtfy.com - When you lazy to use google on your own. 52. midomi.com - When you need to find a song name. 53. google.com/history - See your past searches on the Google search. 54. bing.com/images - Find your mobile wallpapers. 55. faxzero.com - Send an online fax for free. 56. feedmyinbox.com - Get RSS feeds as an email newsletter. 57. ge.tt - Send a file quickly to someone. 58. pipebytes.com - Transfer file of any size without using any third-party. 59. tinychat.com - Setup a private chat room. 60. privnote.com - Create text notes online and will be share. 61. boxoh.com- Track the status of Google maps. 62. mondrian.io - Create vector drawing on online. 63. draw.io - create diagrams and flowcharts in the online browser and after drawing able to export your draw in GooglDrivebe, Dropbox, Onedrive, Github and device. 64. downforeveryoneorjustme.com - find your favourite website offline. 65. ewhois.com - Find the website of a person with analysis lookup. 66. whoishostingthis.com - Find the website for hosting of any website. 67. megaupdate24.com - Learn Blogging and How to Technology. 68. labnol.org - How to guide and software tutorial. 69. learnbyonline.com - Learn Anything On Online without any cost Sponsored by Luthfar Rahman Bhuiyan(LRB). 70. disposablewebpage.com - Create a transient web page. 71. urbandictionary.com - Find the definition of any word. 72. seatguru.com - Visit this site before choosing your next flight. 73. unsplash.com - Download stock image free. 74. zoom.it - Views high-resolution image in a browser online. 75. scribblemaps.com - Here you able to create custom Google map easily. 76. alertful.com - Quickly setup e-mail reminder. 78. picmonkey.com - A great offline image editor. 79. formspring.me - You ask any question or get an answer here. 80. snopes.com - Layer based online image editor. 81. typingweb.com - Typing practise site. 82. mailvu.com - Send video mail using a webcam to anyone. 83. timerime.com - Create the timeline with video, audio, or image. 84. stupeflix.com - Make a movie using audio, video or image. 85. safeweb.norton.com - Check any website trusty. 86. teuxdeux.com - A beautiful to-do app. 89. minutes.io - Create capture effective notes during the meeting. 90. youtube.com/leanback - Watch your youtube video on TV model. 91. youtube.com/disco - Quickly create a video playlist with your favourite list. 92. flaticon.com - Any kinds of vactor and icon are avilable here for free. 93. pngtree.com - Million of png image are here for you to use. 94. mixlr.com - Live audio over the web. 95. radbox.me - Bookmark online video for watching later. 96. tagmydoc.com - Add QR codes to your documents. 97. notes.io - Easiest way to write short notes. 98. fiverr.com - Hire people for any little word with $5. 99. ifttt.com - Create a connection with all your online account. 100. upwork.com - Hire Freelancers & Get Freelance Jobs Online. These are the most useful websites that are really useful for you. If you have more as like these don't forget to share with me via the comment section, I will include that sites in this list. Share this post on social media with all of your buddies.